Sliding miter saws are just what their name suggests, they have a pair of rails at the back on which the saw slides. One of the most glaring drawbacks of this design is the need to have plenty of space behind the saw if the rails are to be accommodated. However, Bosch seems to have discovered an ingenious way around this problem by replacing the two sliding rails with hinged arms. These do not stick out from behind the saw and make for an innovative space saving feature. Quality : Its patented axial glide system enhances durability and precision. An ergonomic ambidextrous trigger handle imparts form-fitting comfort for all-day use. Usability : Stainless steel miter scales and a uniform clear-display bevel make it easy to use the roof pitch angles and marked detents. Using the Square lock fence feature you can get a 90-degree alignment to the table without adjustments. Performance : Cutting capacity is greatly extended; 6-1/2” vertical capacity, 14” horizontal capacity, and 6-1/2-inch crown capacity. The 15-amp motor powers the blade at a no-load speed of 3800 rpm. Robustness : Pre-aligned Square lock fences introduce remarkable sturdiness, robustness, and durability for long-term use. The whole stainless steel make of the Bosch GCM12SD is designed for balance, portability, and strength. The 12-inch (60-tooth) blade is powered at 3800 rpm by a 15-amp motor. An automatic electric brake does a good job with stopping the blade within 5 seconds of trigger release. 60 degrees right and 52 degrees left miter capacity add immense flexibility to the saw. On the other hand, bevel capacity has 47-degree allowances on both sides. A patented Axial-Glide System grants enviable control over the saw’s functions. Not following a standard rail design, you can see 12 inches less space with this product compared to others in the same range. Its trademarked Square lock fences are extremely precise. They need no adjusting and come readily aligned at 90 degrees to the saw table. A one-touch lock/unlock feature lets you access quick-release fences and have them slide into position in a jiffy. The saw is compatible with several different kinds of 12” blades, making it quite versatile. A low guard feature on the blade provides an unhindered view of the cut-line. Standard angles you can set up on the stainless steel miter detent scale are: 0, 15, 22.5, 31.6, and 45 degrees on the left, and 60 degrees on the right. You can fine-tune these alterations using the accessible thumb-triggered push-button override. 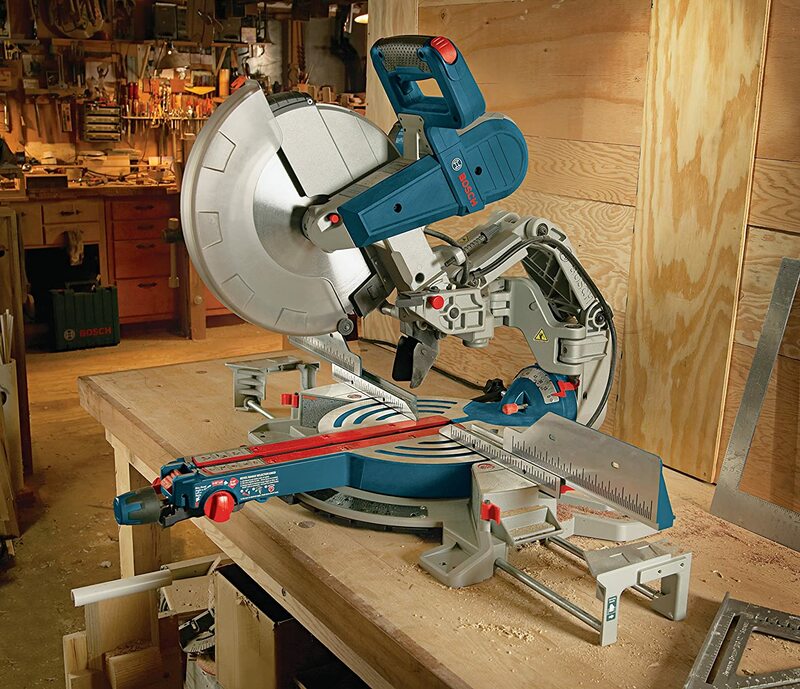 Maneuverability is keen, even more so with this 62 pound compact marvel among miter saws. An ergonomic handles imparts outstanding comfort and has a soft grip and ambidextrous trigger setups for both left- and right-handed users. 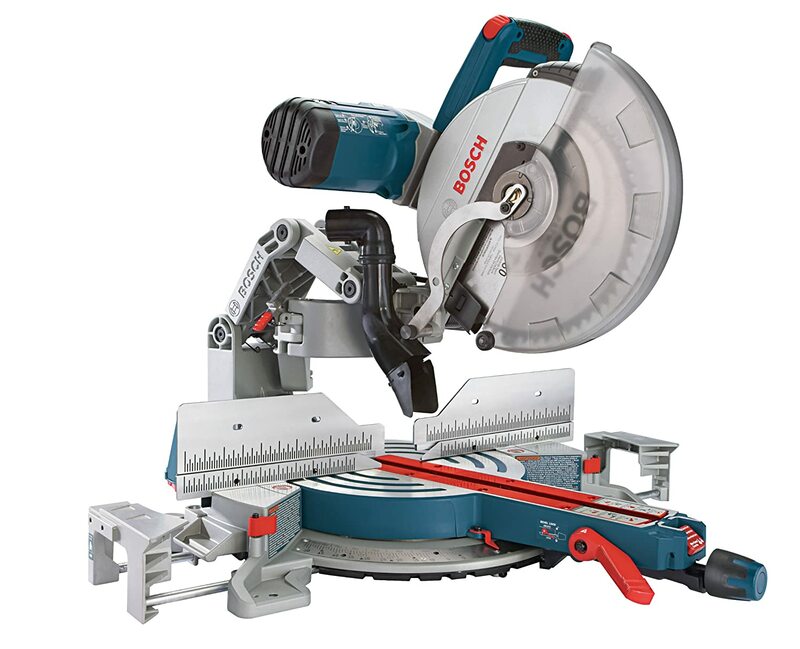 Compared to what the Bosch 5312 has done for users, the Bosch GCM12SD has shown to perform better under duress; for instance, heavy use in a high-end custom cabinet shop is no big deal for this saw. Whereas dust collects easily on the 5312’s sliding rail bearings (at which point you have to indulge a long cleaning routine), the GCM12SD has a hinged arm instead of rails sticking out the back. It comes equipped with built-in stock supports. Thorough and crisp operating instructions make usage easy and simple. It has an extraordinarily smooth Axial-Glide sliding system. You do not need any clearance for the sliding system, the GCM12SD can be positioned right up against a wall. Accessible locations for miter and bevel adjustments (at the front of the saw) add to your convenience. Very little resistance and excellent gliding system. You might need to put in a better blade for enhanced cutting and overall performance. Some minor assembly is needed. Unlike other saws, this one does not come wholly ready to use. However, the assembly in question is merely attaching the bevel lock lever and miter lock knob to the saw front. While the UK version comes with a laser system to help define cutting angles, the US version is lax in it. The saw is very heavy (62 pounds) and not easily portable. All in all, the Bosch GCM12SD has wowed us. Both the bevel lock lever and range selector are positioned right up front to make adjustments that much easier. Both detents and roof pitch angles are marked, not to mention the clarity of the dual bevel scale, making this saw that much more convenient to set and view angles. At 65 pounds, the saw is simple to maneuver but not easy to lift and move, especially up or down ladders. This is merely a small downside to all the other features this device brings. Rendering your work faster, easier, and more accurate the GCM12SD’s crosscut capability is sure to amaze. It can even crosscut through a 13-inch material stood at 90 degrees. Suffice to say its performance is off the charts. Bosch patented its Axial Gliding System for a reason. It has clearly left the competition in a dust cloud as the GCM12SD raced ahead with this innovative idea. Designed to help you make some of the smoothest cuts imaginable, you also have total control over functionality. One of the best things about this feature is the absence of a traditional rail system. Compared to other saws in the same range and product type, this one occupies 12 inches lesser space and works even better than anything with rails sticking out. Bizarrely, the Bosch GCM12SD performs such smooth cuts that they can be a little too smooth. Add tension to the sliding mechanism by targeting the glide movement controller through the on-board wrench, and you are all set. You can rely on the 6-1/2 inch vertical baseboard to let you crown mold to great success. In addition to these and several other factors – miter detent adjustments from 0-60 left and bevel detent adjustments from 0-45 for left and right – you also have excellent cutting capacity, safety, performance, and overall excellence with the Bosch GCM12SD.